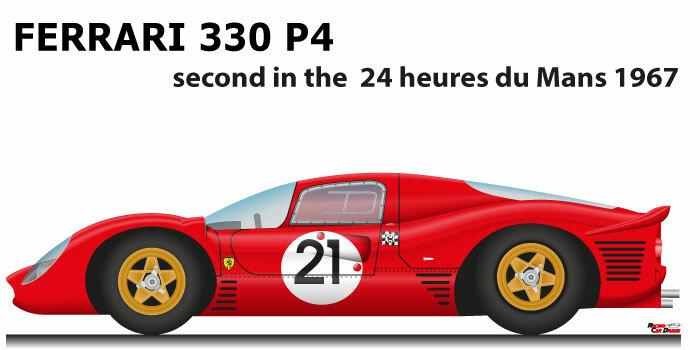 The Ferrari 330 P4 n.21 is a car that participated in the 1967 24 Hours of Le Mans. After the scorching defeats suffered in 1966 by the Ford in the Sport Prototype Championship, the Maranello team replaced the Ferrari P3 with the new model P4. Designed by Piero Drogo, the car was much more powerful and underwent some changes during the season. Ludovico Scarfiotti and Mike Parkes at the wheel of the Ferrari 330 P4 n.21 came second at the 1967 Le Mans 24 Hours. The challenge between the Italian team and the Ford American, proved to be very beautiful. Despite the numerous withdrawals of the Detroit cars in the race, Ferrari had to settle for second place with a gap of 4 laps from the Ford MK IV n.1 of Gurney and Foyt. At the end of the season, Enzo Ferrari was content with the victory of the Sport Prototype Championship. Transmission: Ferrari five speed Manual.